I’m more than happy to admit that I’m a very late joiner to the Khemmis train. Oh, sure, I’d heard the name around, I knew they were pretty well liked and that there was a fair bit of hype building behind them, and had even caught a glimpse of their eye-catching artwork here and there, but – for whatever reason – I’d just never found the time to actually listen to one of the band’s songs/albums. Thankfully, their brilliant performance at this year’s edition of Maryland Deathfest made me an immediate convert to their cause, and I’ve spent the time since then immersing myself in the band’s back-catalogue and catching up on everything which I’ve been missing, just in time for Desolation to drop into my inbox with a resounding (digital) boom. Unsurprisingly the vocals of Phil Pendergast are still the star attraction in many ways. But while the man has always been possessed of a fantastic voice, this time around he seems to have discovered a new level of confidence and clarity which truly marks his ascension into the top tier of today’s Metal vocalists. His performance throughout Desolation really is that good. 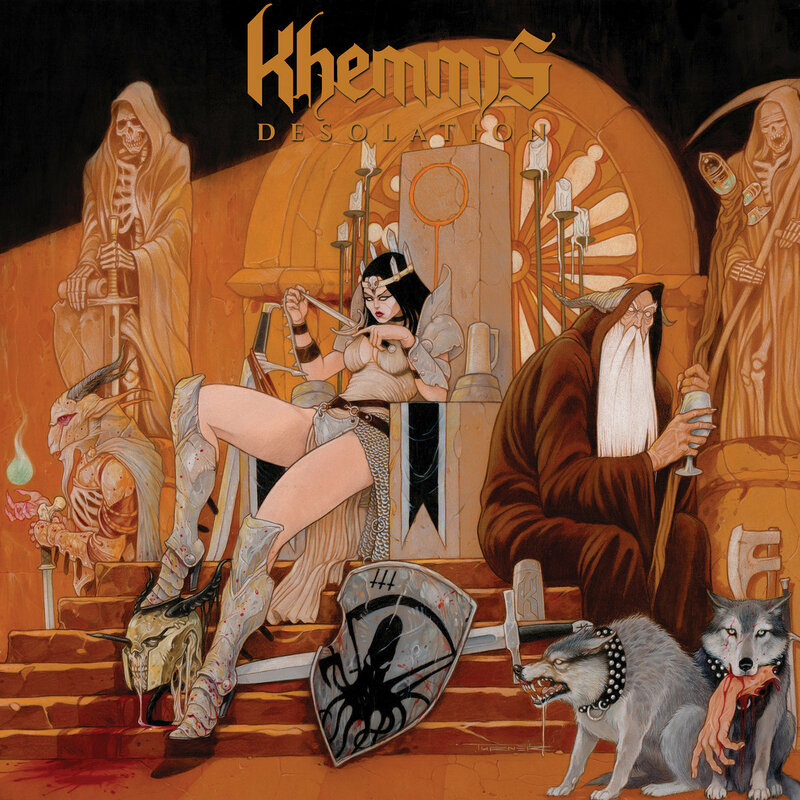 Of course Khemmis is not simply the Pendergast show, and the contributions of his bandmates (Ben Hutcherson, Daniel Beiers, and Zach Coleman) are just as vital to the band’s ongoing success. After all, while the vocals may be the figurative icing on the cake (with Hutcherson’s ragged snarl – deployed on this album more judiciously but, arguably, more effectively than ever before – adding an extra dash of flavour here and there), the real meat of the band has always been in their riffs (and drums), and these are tastier than ever on Desolation. And, yes, I’m aware that meat and icing don’t necessarily go together. Try not to overthink it. 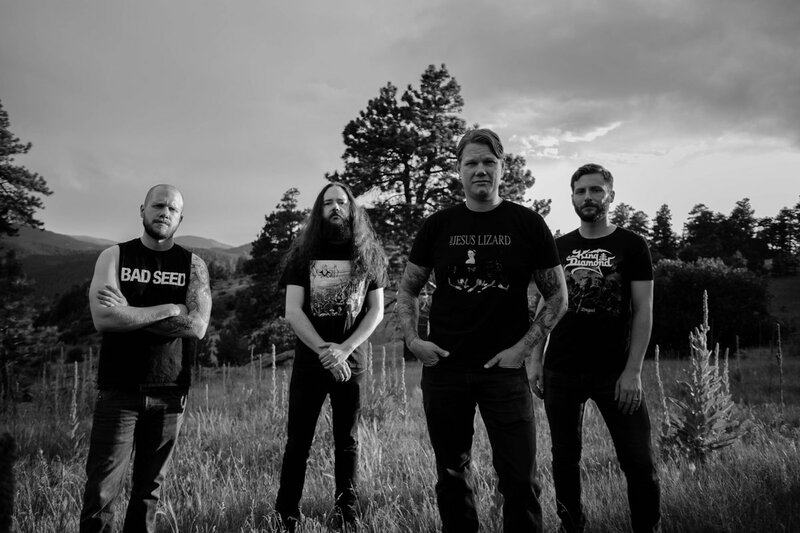 All metaphorical meta-commentary aside, however, it’s hard to see how anyone could come away from listening to this album without finding at least something to love about it, as the band’s sound touches on and embraces so many classic, fundamental elements of Metal – melding moody, doomy grooves and swaggering Trad-Metal riffage with a bevy of artfully progressive touches and extravagant melodic hooks – that it seems almost tailor-made for massive, and far-reaching, success. It’s probably also worth pointing out that while the band have always had their roots in the Doom scene, to judge them purely as a Doom band – particularly at this stage in their career – would be a mistake, as the band’s sound owes just as much (if not more) to the upbeat, shamelessly catchy strut of classic Thin Lizzy, Judas Priest, and Iron Maiden, as it does to the spacier, more introspective approach championed by the likes of Black Sabbath and Blue Oyster Cult. Of course, just having the “right” influences or being in the right place at the right time would all be for nothing if the band didn’t have the actual songs to back it up, but one listen to the opening triptych of the indulgently bombastic “Bloodletting”, the irrepressibly poppy “Isolation”, and the imposingly anthemic “Flesh to Nothing”, should quickly put those concerns to rest, while the climactic trinity of “The Seer”, “Maw of Time”, and “From Ruin” should provide more than adequate proof that the band haven’t forgotten or forsaken the darker, heavier dynamic which made their previous albums so successful either. Perhaps the most important thing I have to stress, though, is that there’s never a minute, never a moment, where it feels like Khemmis are doing any of this out of anything other than a sincere love of the genre. They’re not – like so many before them – simply paying shallow lip-service to “classic” Metal tropes while desperately capering for mainstream attention and validation. They just happen to have written a proper, blood-and-thunder, horns in the air, Heavy Metal album, which has all the inherent potential to make the band into a household name. And while I often tend to find my thoughts and opinions diverging from the common consensus, this is one occasion where I’m happy to be in full agreement with the majority of my fellow writers and reviewers. So when Desolation inevitably skyrockets the band to new heights of critical and commercial success… try not to hate them for it. Instead you should turn that hate on those other bands who have also been successful without being anywhere near as good!